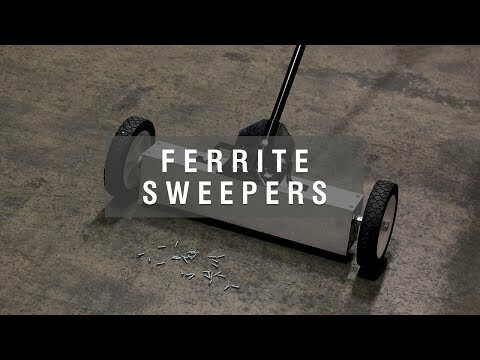 Pick up sharp ferrous objects quickly and effortlessly with this magnetic sweeper, complete with 22 inch ferrite magnetic face, switchable release and adjustable handle. To learn more on our magnetic sweepers, including the potential benefits to you and your project, visit our magnetic sweeper brochure. 22 inch ferrite magnetic face. Stray ferrous items like nails, screws and building debris can cause havoc with tyres and cause injury to livestock; often these items go undetected waiting for an accident to happen. Our magnetic sweepers are the ideal solution; essentially a large ferrite magnet on wheels the sweeper will collect all ferrous debris that it is pushed over and once done you can simply pull the magnetic release and see the items drop away. One of these sweepers could literally save you hundreds of pounds on tyre repairs! At MAGNET EXPERT®, we have a wide range of Ferrite and Neodymium magnetic sweepers, including suspended, combi and handheld. Visit our magnetic sweeper brochure and discover how a magnetic sweeper can bring ease and efficiency to your project. brilliant bit of kit, every boy should get one for Christmas. Never knew I had some many nails, screws hidden in my car park!